My friend, Sharon was telling me about her mother visiting her during the school holidays and how happy and blessed she felt when her mother cooked all her favourite dishes. One of the dishes she mentioned was this ginger, egg and wine soup. The way she described the taste and how cosy she felt after eating and drinking this soup really set off my salivary glands working overtime. Her description and enthusiasm was infectious! I decided to cook this since I've got a bottle of raisin wine lying idle at home. 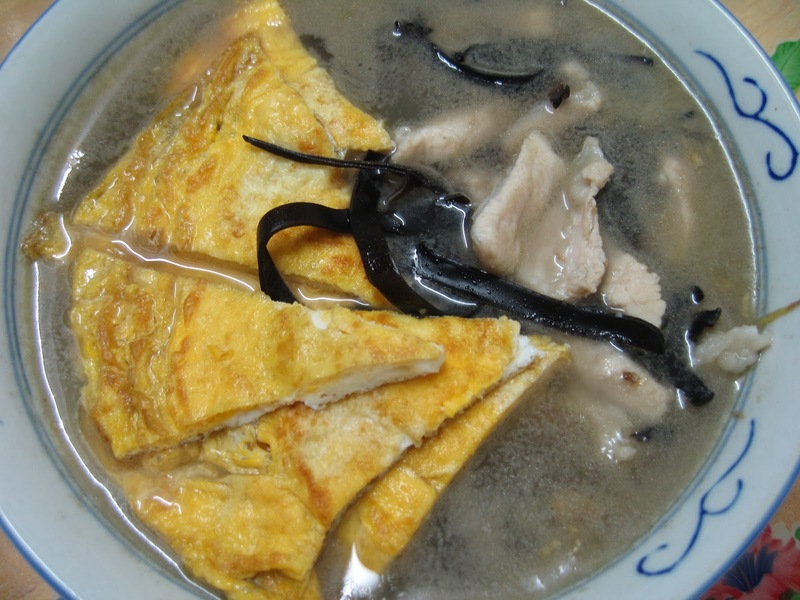 It wasn't difficult because my mother used to cook this for me during my own confinement. I just had to rack my brains for the recipe. But of course, if you are cooking for confinement ladies, you must add in lots more ginger and wine than the amount that I mentioned below. I remember my mother used ginger shreds to fry the beaten eggs in addition to the ginger she used to cook the soup. Oh, it was very delicious! I fully understood Sharon's enthusiasm over this dish. Even this milder version I am sharing now, really kept me warm and cosy after dinner. 1. 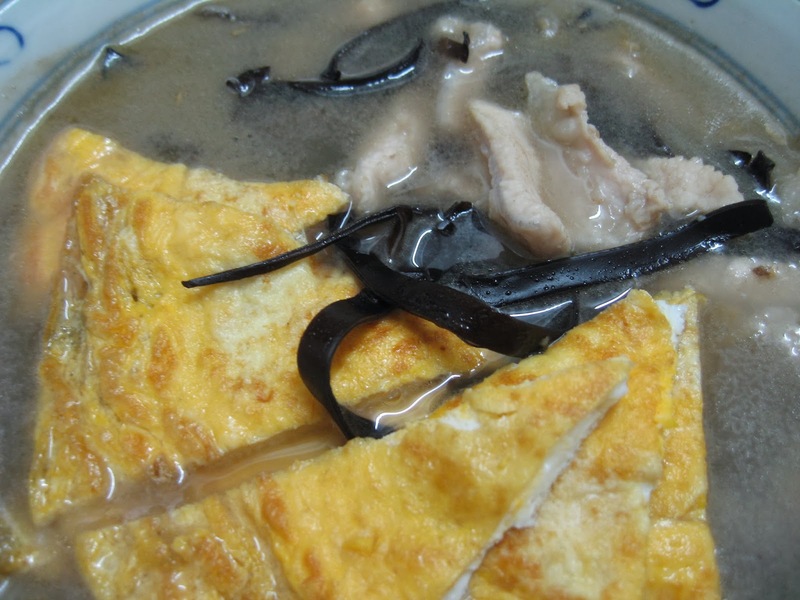 Heat wok, add 1 tbsp cooking oil and fry beaten eggs to make an omelet. Remove and cut into wedges. 2. Add the remaining 1 tbsp cooking oil into the wok. Saute the shredded ginger strips until golden. 3. Add in the pork slices and stir-fry for one minute or until the pork turns whitish. 4. Add in the shredded black fungus strips and continue to fry for another minute. 5. Pour in the stock and bring it to a boil. 6. Add in omelette wedges. 7. Add in wine and switch off the fire. Stir to mix evenly. 8. Pour into a large soup bowl. certainly very delicious! i do cook glutinous wine with chicken once in a while without the omelette..slurp! Merry Christmas! I love confinement food too... this looks nourishing and delicious. Wishing you a Happy New Year! And a wonderful 2014 ahead! Hi Doris, this looks very yummy and perfect for a cold rainy day! Thank you for joining me in Aspiring Bakers! Thank you everyone for all your encouraging comments.